The Massachusetts Bar Association Task Force on Lawyer Discipline, appointed in September by MBA President Kathleen M. O'Donnell, has completed its study and report on the lawyer discipline system in Massachusetts. The MBA Nominating Committee in accordance with association bylaws has issued its report recommending officers and delegates for the 2005-2006 association year. The report was accepted as no challenges by petition to the slate of nominees were received. The recently launched judicial evaluations system is performing better than expected. Just as predicted, attorneys are not using performance evaluation forms to unfairly criticize judges and the privacy of judges and evaluators is being strictly protected. 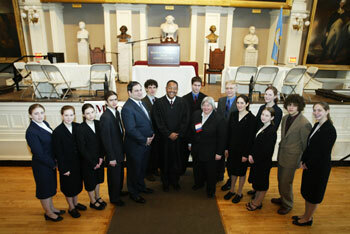 Left to right are: Alyssa Crowther, Amira Shulman-Kumin, Alana Horowitz-Friedman, Elias Sanchez-Eppler, Mock Trial Committee Chair Eric Schutzbank, Ian Cutler, Supreme Judicial Court Justice Roderick L. Ireland, David Sheppard-Brick, MBA President Kathleen M. O'Donnell, Gary Huggett, Emma Sokoloff-Rubin, Chelsea McGrath, Hannah Moriarity, Michael Fiorentino and Tiam Hamkins-Indik. For the second year in a row, two high schools battled to the end for the statewide Mock Trial Program Finals.